These slippers are both beautiful and comfortable Discover why Ballerinas from the English National Ballet to the American Ballet Theater and beyond have chosen A. Andreassen slippers for their second shoe. Inspired by the designer's Scandinavian heritage and high fashion background, A. Andreassen has created one of the most beautiful and comfortable slippers on the market. Leathers are sourced from the finest mills in Italy and handcrafted by artisans in Portugal. 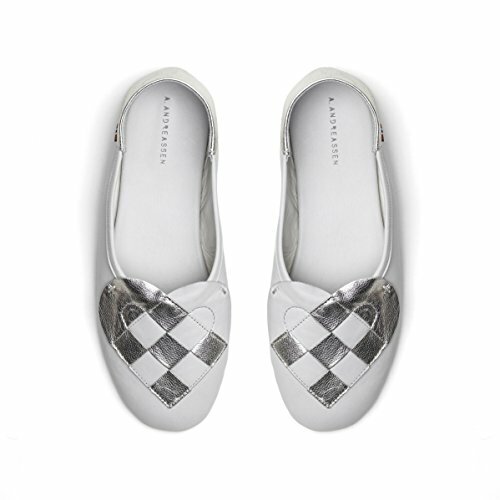 These luxurious slippers are made from creamy soft Italian white leather with vibrant metallic pearl detail, suede outsoles and a padded footbed for extra comfort. Perfect for Brides and Bridesmaids. Slim fit but true to size. For half sizes and wider fit, go up one size. Soles are suitable for indoor wear. Fully leather lined. Also available in wool felt. If you have any questions about this product by A. Andreassen, contact us by completing and submitting the form below. If you are looking for a specif part number, please include it with your message.